We are proud of the quality products we carry for your home comfort. In addition we service what we sell so you can rely on us for all your home heating, AC, indoor air quality, water heaters and more!Below is a list of the type of products and manufacturers we carry. 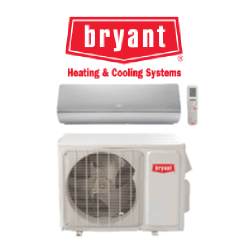 We carry Bryant Furnaces & AC units, Mini Splits, Geo-thermal, Air Purifiers, Humidifiers & Heat Pumps. We'll Help You Choose the Right System For Your Home! GPS is "Engineering Air for a Better World"
Global Plasma Solutions offers a indoor air quality solution that installs in your vent for cleaner, healthier air in your home! Radiant heat is the most comfortable and efficient form of home heating. Radiant floor heating systems conduct heat through the floor which then broadcasts heat to every cold object in the room, especially to you.